Gabriele Linkes Teaching Cultural Studies is a collection of essays concerned with the teaching of British-American cultural studies at university level. 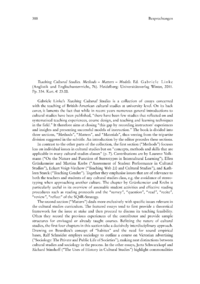 On its back cover, it laments the fact that while in recent years numerous general introductions to cultural studies have been published, there have been few studies that reflected on and systematised teaching experiences, course design, and teaching and learning techniques in the field. It therefore aims at closing this gap by recording instructors experiences and insights and presenting successful models of instruction. The book is divided into three sections, Methods, Matters, and Materials, thus veering from the tripartite division suggested in the subtitle. An introduction by the editor precedes these sections.